Welcome to Davies Cruise Agencies, Inc.! This popular Hula Halau made up of 25 performers which includes a live Hawaiian band consisting of singers, Ukulele, bass and guitar along with their Emcee Shelsea Ai Apana. The dancers come from the most revered hula school in Hawaii. Perennial winners of prestigious hula competitions throughout Hawaii, the halau features its “Keiki” (children) dancers between the ages of 6 and 13 and their beautiful “Wahine” (women) dancers. Their performance reflects a renewed insight to the rich culture and heritage of this tiny island state. 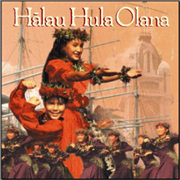 Halau Hula Olana or “School of Living Hula”, which began in 1975, has traveled extensively and has performed in Europe, Asia, South Pacific, and throughout the United States. The halau, or school competes in the Keiki Hula Competition as well as The Merrie Monarch Festival, which are the most prestigious hula competitions in the world. The halau has been invited to represent the United States of America at the Shanghai Children’s Cultural and Arts Festival and have also traveled to Venezuela as Ambassadors of Aloha as well as many other countries. As dignitaries visit Honolulu, the group is often asked by the Governor to perform for leaders throughout the world. They have performed for Presidents Reagan, Bush, Clinton and their respective wives and family. The Emperor and Empress of Japan, the King of Tonga, Prince Charles with Lady Diana, The Dalai Lama, Desmond Tutu and more. Halau Hula Olana has also performed for Japan’s Prime Minister Abe’s reception when he was in Honolulu to demonstrate the power of reconciliation for the 75th Anniversary of Pearl Harbor. Prime Minister Abe and President Obama laid wreaths at Pearl Harbor together. Halau Hula Olana has also had the pleasure of performing on stage with many International Super Stars that include: Enrique Iglesias, Cierra, Kris Allen, The Goo Goo Dolls and Train for the NFL Pro Bowl Halftime and Pre-Game performances and have provided dancers to be featured on Hawaii Five-O as well as a feature film. Performing at special events gives these endearing children and women an opportunity to meet people from all over the world and share their message of “Aloha” from Hawaii. Some of the highlights of the show include their signature song “Surround Me With Love”. The children dance into the aisles and up close to the guests in their seats. This dance melts the audience’s hearts and draws them in closer to the children. Another signature song is about the meaning of the word Aloha. The letter A stands for Akahai (Kindness), L for Lokahi (Unity), O for Olu ‘Olu (Pleasant), H for Ha’a Ha’a (Humility) and A for Ahonui (Patience). The littlest keiki walk into the audience and shake hands, thanking the audience for coming to the show as the Aloha Chant and Aloha Oe play. Shelsea (our Emcee and their Kumu (teacher) ends the performance with the children gathered all together back on stage to wave and saying Aloooooha! The energy that has built to this point results in a standing ovation in a majority of our performances. There is also a good feeling listening to the audience as they leave the theatre. Lots of wonderful memories of the show are shared between the guests departing and the children are remembered with warmth and smiles. Copyright © 2018 Davies Cruise Agencies, Inc. All rights Reserved.